Buying real estate isn’t like much else in the world. No other purchase requires as much forethought or demands as much consideration before undertaking. You simply do not casually take part in it the way you would buying a cup of coffee, a new tv, or even a car; yet it is also one of the types of transaction that generally you don’t do very often, so it’s hard to really get adept at it unless you’re in the business. Thankfully that’s exactly where a qualified and experienced real estate agent will come in! But even if you have the very best agent there are still some things you can do to be well informed before the home buying process begins, here’s some ideas to get you started. If you’re moving across town this isn’t such a big deal, but if you’re moving across country you may want to take a little more time. Visit the area to get familiar with it geographically and use the internet to study local amenities and find where important things like your work, hospital, and grocery stores are located. Your agent can likely help here as well! For most money doesn’t just grow on trees and as such some homes you like just may not make sense financially. While you don’t necessarily needs to know an exact figure having a ball-park idea of what you can afford in a home is a good place to start. Thankfully, this too is something your agent can help you with! A lot of times the best thing is just to let your agent work their magic. It can be easy to misstep and say the wrong thing around sellers, to get indecisive in regards to whether one house is more right over another, and sometimes trying to be helpful can actually be a hindrance. So talk with your agent, understand their plan and your part in it, then let them do that voodoo they do so well — it is after all why you sought out their help! These quick tips will help you get off to a great start, and your agent will likely appreciate them too! If you’re still looking for a home, or need to sell your current home please get in touch to find out how we can help you! Homeowner Emergencies: What You Should Know! It’s not something any new homeowner wants to think about. EMERGENCIES! The ink on the paperwork is just barely dry and you finally got all the stuff moved in…when disaster strikes! And to be fair, emergencies happen when we least expect them so it’s not a matter of if so much as a matter of when something unforeseen will arise in your new home. The thing to do is to be prepared – so we’ve put together some tips to help! Whether it’s somebody up the street digging or a big storm blowing through, power outages are one of the most common things you will deal with as a homeowner. Make sure you have candles as well as several flashlights readily available and with working batteries on hand. Keep your refrigerator closed – you can’t tell how long the power might be off and you don’t want food to spoil. It doesn’t hurt to have a few gallons of purified water on hand as well as a small propane fueled heater for winter time. Oops! Lost the keys, or left them on the counter and locked the door on your way out. It happens, you get locked out of the house, but a little pre-planning can be a life saver! There is of course the old tried and true hollow rock method of hiding a key in a nearby flowerbed. Alternately you might consider leaving a spare key with a *very* trusted friend or neighbor. These can come in many forms from busted pipes to water heater troubles or even betrayal from your trusted dish washer. Whatever the cause the first immediate cure should be simple: Turn Off The Water! Turn it off at the source — usually near your water heater. Once that’s done you will be able to assess the situation and contact a plumbing professional if their help is needed. Fire is one of the most terrifying things a homeowner might face. First, do not panic! Keep a box of baking soda on hand as it can be used to extinguish many small flare-ups. For stove top flames NEVER USER WATER! Cover the pan with a tight fitting lid and do not open it until the flames have had a chance to die down. A fire extinguisher is good, but educate yourself on the types of extinguishers and how to use them as not all are good for grease fires and may even cause the flames to spread! Above all cool heads will prevail! Whenever something happens take just a second to think first, stay calm, and then act. Over the course of a lifetime in a home unexpected emergencies are bound to happen, so be prepared! Keep a list of emergency numbers right on the fridge – ask your agent, they likely can get you one! Is Your Home Budget Cramping Your Style? You’ve found the perfect place and made it your own. The boxes are unpacked and it’s been a great time getting settle in and making it your own. But well…you haven’t really changed much yet. Part of that could be because you really found the perfect place, just the way it is, but if you’re like many homeowners the biggest challenge you face when the honeymoon days are over is budget. So here are some great ideas for decorating your home on tight purse strings and still getting a lot for your dollar! Tried and true a fresh coat of paint works wonders to transform any room and is also one of the most affordable updates you can do yourself as well. While you can always hire a profession if it’s in your price range you really can handle most paint jobs on your own. Maybe start small, do a closet or kids room one weekend to get your skills honed in and then go for it! Believe it or not, the cheapest update – one that could even make you money – is just not buying more stuff you don’t really need. If it’s too late to prevent that you should look into possibly getting rid of some stuff you don’t need to clear space. Not to get all hoopy-froopy but having more open space really does lend a cleaner feel to a space rather than having it over stuffed with…well…STUFF. Getting a new piece of furniture? Remodeling a room? Think storage-first! One thing the tiny house movement has taught us is that any time you can reuse or re-imagine how an area works you can save space. Foot stools with lids that open, hide-away spaces under stairs, and wisely cycling out home items based on season are all great examples of thinking storage-forward. These three things are just a good place to start – get creative! There are always new ways to transform a space if you put your mind, some time, and a little elbow grease into it. And of course don’t hesitate to talk to me, your trusted real estate pro about ideas for making your home even better! Paint Your Kitchen Cabinets Right NOW! No, seriously, do it. Do it NOW! The kitchen is often thought of as the heart of the home; no one can argue that especially as the holidays get close it’s one of the busiest rooms in the whole house! That being the case it should be of extra importance that it look good and function as well as possible. A large part of the appearance of your kitchen of course are the cabinets. The cabinets in your kitchen really set the tone of the room – it’s too bad so many people choose drab over fab. If your conscience hasn’t already gotten the better of you here are a few more reasons to paint those cabinets! Ok, so maybe that’s a bit overboard…but seriously, if your kitchen is dark and scary who’s going to want to spend time there? Dark colored cabinets that are old or dreary have got to go. A reflective surface for your backsplash will help further, by bouncing light around the room to make it feel more spacious. Think bright, light, and welcoming! SOLID! But you don’t want to be superfly! If you’ve got old wood paneled or just out-dated looking cabinet styles in your kitchen it may be time for them to go. A coat of paint can take your cabinets from “meh” to masterful in just a day. That’s right! It’s EASY! And that’s reason enough right there. A little sanding, and a little paint can really go a long way towards not only sprucing up your cabinets but also breathing new life into your entire kitchen. When it comes to bang for your buck painting your cabinets is among some of the most affordable ways to drastically change the feel of a room. Period. End of statement. If there is one room in your home that can make or break the sale it’s the kitchen. If it’s perceived to be too small, or unwelcoming, it just might be the deal breaker that keeps your home from moving off the market and getting you maximum return for your dollar. Whereas a complete renovation may cost too much, take too much time, or just be more than you want to deal with, painting your cabinets can really turn things around in a big way for not a whole lot of dollars out of pocket. Whether you’re looking to update your exiting home to sell or need to find a new place to call home get in touch – I know the local area and can help make your move the right one! Time to Move? Or Just Improve? It’s a fairly common thing, you’ve lived in your home for some years and either your lifestyle has changed, the kids have moved out or grown up, or maybe you’re just tired of the same old thing. You look around and simply need more space, or realize there’s just no way to reconfigure the floor plan without major changes. Whatever the case your long term plan didn’t include any of these things when you first set out; now it’s time to decide what to do in order to get it the way you want. If you’re not sold on moving yet, consider revamping some of your living spaces. While not all home improvements are equal there are some that will add value to your home over others. A good place you can almost always regain value is by upping your curb appeal. Small remodel projects can make your home like a new place. Especially if you are getting that new big tub in the master bath or some other luxury you’ve always wanted as part of the deal. Small remodels are a great way to sate the need for change without the cost of a new home. It’s not a sin to up the ante and do a serious full remodel of your home. If you love the area, don’t want to move, and have the budget a remodel may provide you with the best of both worlds. Repainting can really change the entire mood of your home. Consider a fresh coat in rooms that need a re-do; think about moving the furniture – or even getting new furniture – to turn those rooms around. Maybe there is nothing to be done. Maybe it simply won’t work – you need more room, or less room – and have to make the move. If that time has come we’re here to help! The real estate market is really moving; we’re seeing homes moving quickly – and even multiple offers! Given the limited number of homes for sale that might suit your needs it’s always a good idea to work with a qualified REALTOR® when the time comes. Spring is here at last! With dust in the air one thing that comes to bear ever year is all the odors that have been sleeping during the Winter. It’s easy to think that musty smell is coming from your carpets, curtains or other upholstery, but fact is you may not need to look that far to find the culprit. Not to worry, there’s no need to throw out your favorite pup! Just make sure to give them regular baths and take care of grooming. Have a kitty? Keep that litter box at bay by cleaning it out frequently; using a little baking soda to help absorb smells. Fresh flowers are a great way to not only improve the visual aspects of a room but they can also bring in fresh spring-like smells. Don’t go blooming crazy of course! There can be too much of a good thing, but this is always great, especially if you have guests coming over – just make sure they don’t have allergies. Lemons are a olfactory powerhouse – and they have a lot of uses for cleaning as well! 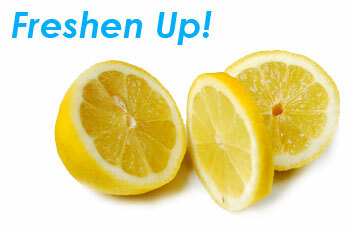 Throw a “used” lemon into your garbage disposal with cold water to fight stink in the sink. A few peels from a lemon can keep that “fishy” smell down in your trashcan after seafood night. Yes, this magical elixir is a life saver in any number of situations, but it can be used to fight odor and leave your room smelling great too! Just put some fresh ground coffee in a small bowl, leave it in a closed room overnight, and by the next day the smelly odors will be replaced with wonderful java aromas! You can put a little in a coffee filter and tie it shut to place in closets or footlockers as well.